Well folks, here we are again. In a move that won’t surprise our regular readers one bit, I have fallen irrevocably in love with yet another vintage chair. 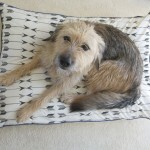 That moratorium on chair adoption I mentioned a while ago? Disregard it. I certainly did. 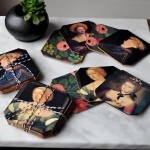 Last week I was on an evening mission to the craft store to get a few supplies for the coaster project. Out of habit, I popped into the adjacent Goodwill. I have a well-established loop for this Goodwill: I scan the furniture, check the textiles, loop over to the aisle of frames and art and exit by way of the ceramics. I was on my way out when something – some strong cosmic force – made me veer from my well-trodden path and return to the furniture section. This time when I walked by (screeching to a halt like a cartoon character at the edge of a cliff), I was able to see through the veil of 1980s Golden Girl fabric to what lay beneath: the most beautiful, solid, comfortable, mid-century recliner in the history of the world. Truly. The whole history of the world. I smelled it, poked it, peered underneath it, took photos of it, reclined in it and, finally, recognized we could never be apart and paid for it ($30). I went back the next day with the truck to bring my baby home. I love the tall back and that little peaked detail on the arms. It really is insanely comfortable. I’ve barely gotten out of it since I brought it home. This photo shows it with the footrest up, but it also kicks completely back so you’re practically lying down. I don’t think the little wood panel on the front is original. It has a pretty grain, but is definitely a different kind of wood from the rest of the chair. I’m thinking I’ll probably remove it, but would love to hear your thoughts. 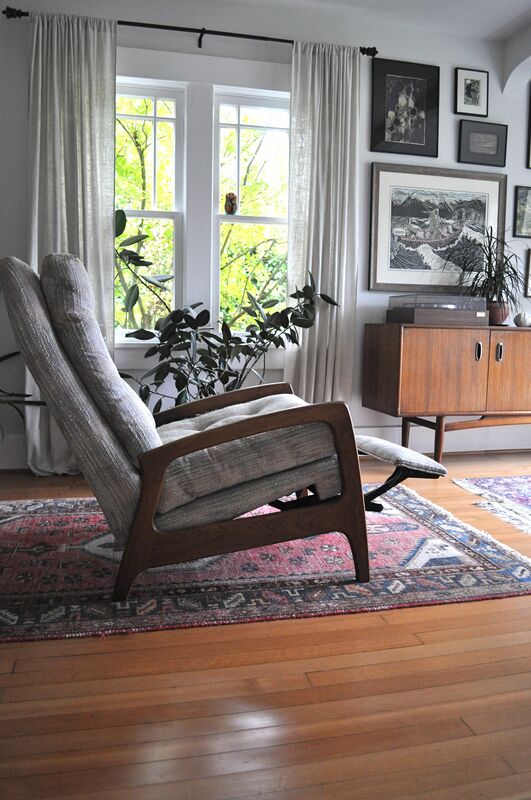 There aren’t any designer markings on the chair, but by googling ‘mid century recliner’ I was able to find another one. 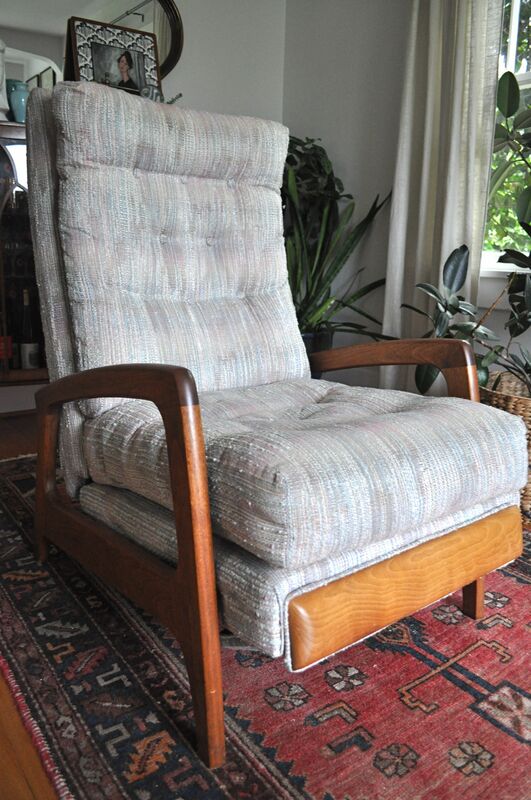 It’s listed on Chairloom (the upholstery company of my dreams) as a “Milo Baughman style recliner” and they’re asking $1200 for it as is. I think that’s probably a price that’s been inflated by an MCM-hungry market, but I sure hope someone buys it so they’ll put it in their Before & After gallery – a place I sometimes go to daydream. And speaking of daydreaming, I’m mulling over upholstery options that will take this little lady from Bea Arthur to Bea-utiful. 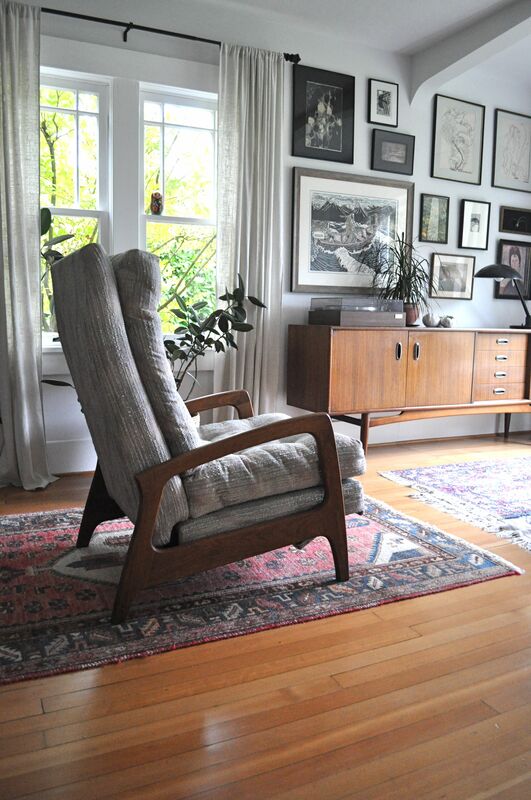 Here’s a very similar recliner upholstered in grey linen. I like the clean simplicity of the fabric, though I’d probably go with a darker shade – closer to a charcoal grey. 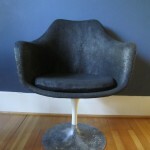 Or perhaps a grey velvet like this one? It would be so plush! Or is that too safe? How about a maritime blue? Or… an electric raspberry velvet like this one? 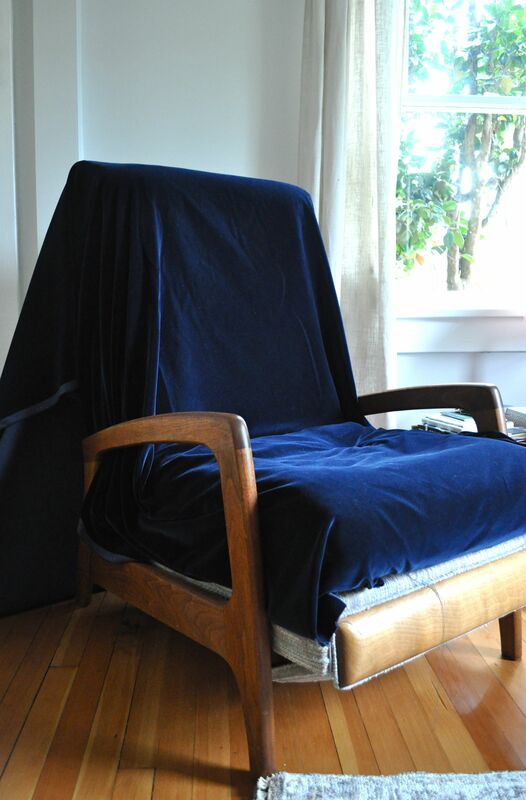 When Mera last visited we found this incredible navy blue cotton velvet upholstery fabric for a smoking deal. 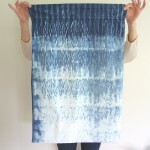 Mera – in her infinite wisdom – convinced me I needed to buy it even if I didn’t have a particular project in mind. I’m not sure there’s enough yardage, but oh my. The way the warm wood looks against the blue is unbearably pretty – it’s the Helen of Troy of chairs; the chair that launched a thousand ships. I’m considering trying to upholster it myself – after all, the months (yep, months) it took to upholster the bed chair are but a hazy memory; the staple removal-induced claw hand only recalled when there’s a storm-a-comin’. I’m eager to start right away, but in the short term I guess I’ll have to pull on my best caftan and embrace this Golden Girl just as she is. What are your thoughts? Linen? Velvet? Something else entirely? Keep the front wood panel or nix it? I’d love to hear! Wait. Goodwill comes in SUPERSTORE size?? Gotta find me one. Your vote is noted! And yep, it’s like the Big Gulp of thrift stores. Velvet (my velvet passion still rages unrequited). And write in your inimitable style about every step! 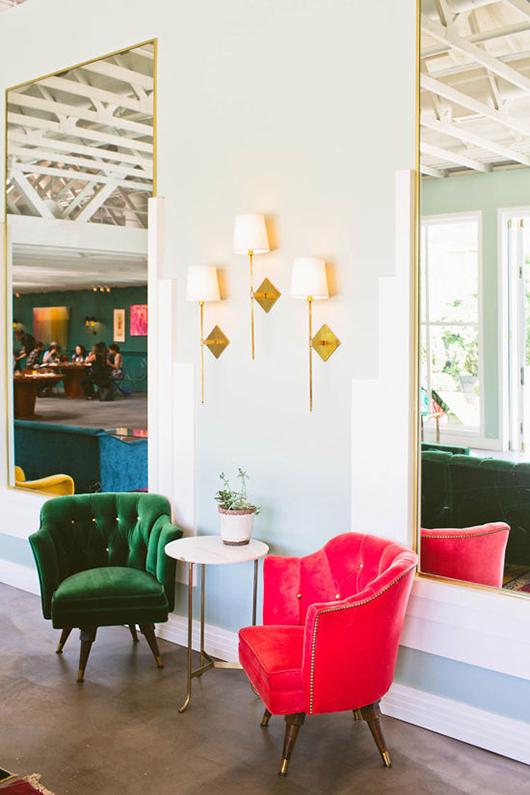 Velvet would just be so cozy! Thanks for weighing in Katy! I vote for velvet too—and I do like that blue! I’d ditch the wood panel though. I’m looking forward to reading more about this chair’s transformation. And I’m looking forward to transforming it! Thanks for the vote – that blue really is beautiful. I have the exact chair. Found at ARC thrift for $15. 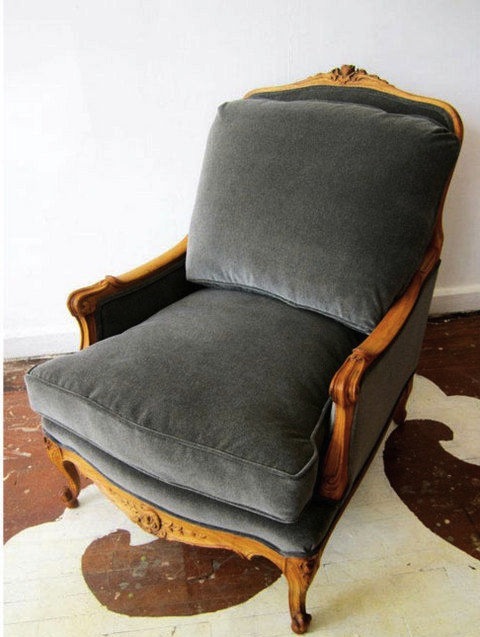 I reupholstered it in a very light gray blue velvet. Stunning! nix the wood panel! Great find! Noted! Nixing the wood panel seems to be the majority vote; thanks for weighing in! 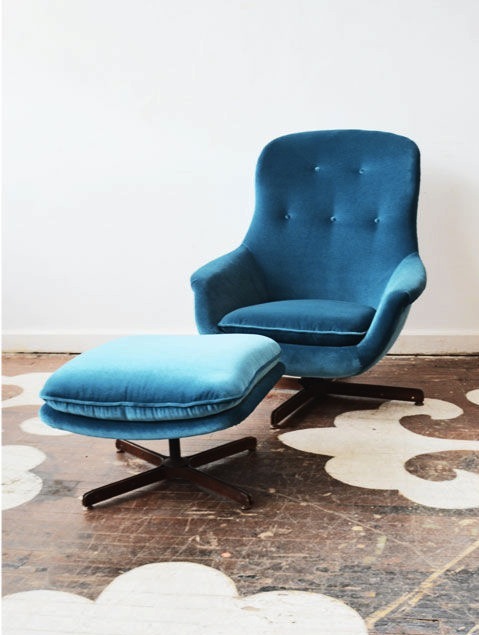 I vote for velvet but I don’t think that particular blue is it…what about the blue in the rug this remarkable and remarkably comfortable chair is sitting upon? Off with the front piece wood too. Aesthetically it isn’t quite right although they probably put it there to protect the fabric. What a stunning timely gift to yourself! Dressed in blue velvet she will be a knockout. I vote off with the panel! Oh man Judy, I am such a birthday glutton. I found this chair days before my actual birthday but still totally used it as justification. It’s now days after my birthday and I’m still justifying all manner of indulgences… thanks for voting! What a great find! 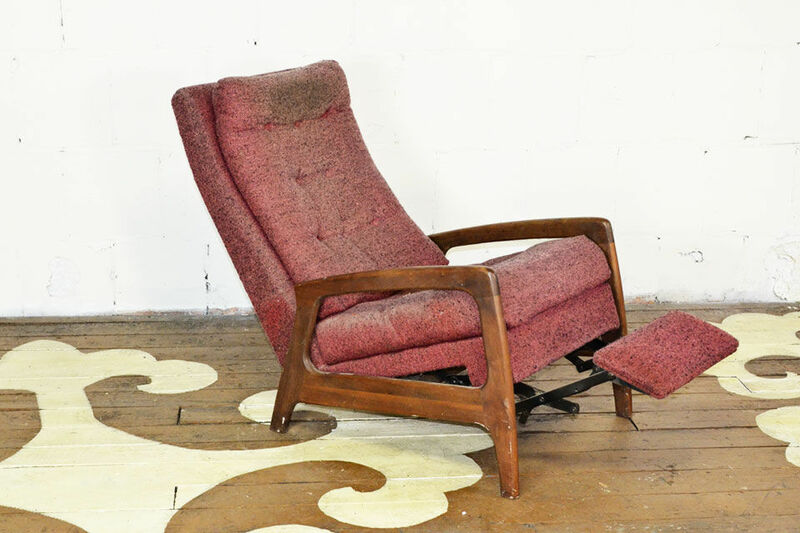 I am a recliner fan and to see one this beautiful in my favorite vintage period makes me drool. 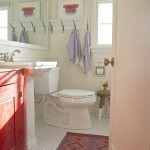 I vote for a pale cloth to keep that gorgeous wood (minus the panel) the eye-grabber that it is now. I need to come and wish you happy birthday in person and recline in this gem! Most recliners seem so lazy-boy-ish, if you know what I mean. I really like the openness of this one. I vote for that warm grey velvet – if you could find it. Velvet looks so inviting. Maybe you could treat the wood piece like one of your coasters – Mod Podge a little landscape on it if you can’t just get rid of it. You’re still the champion of chairs! Yes! Verified! My Artist Cousin and I agree on the fabric! Champion! 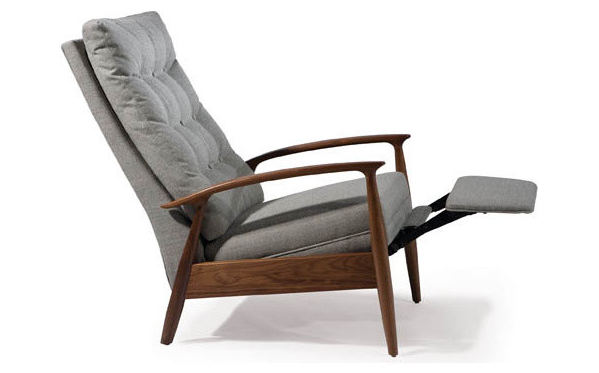 I’d never met a recliner I liked until Mera and visited DWR in Seattle. 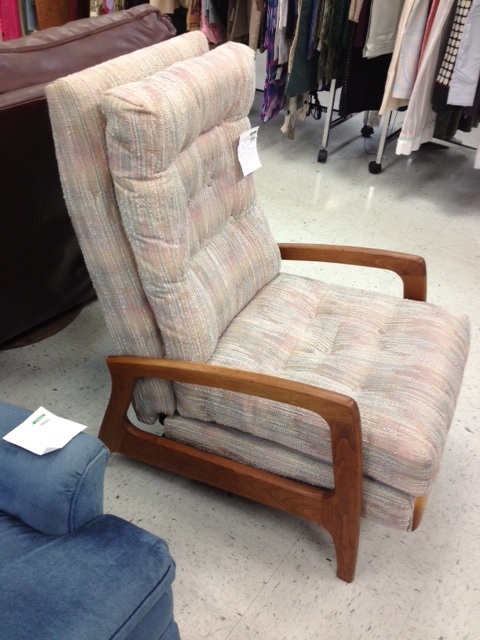 The Milo Baughman recliner there showed me how pretty (and insanely comfortable) they could be, but I didn’t expect to find one I could afford. I love that grey too – I think I’d just sink in and never emerge. Whatever you do it will be amazing! Good score! Those colors are gorgeous – thanks for the link! That is a gorgeous chair! How I wish I had found it in my Goodwill (yes MY Goodwill because I’m possessive about thrifting) because it is an astoundingly good find. The built-in foot rest makes me covet it even more. 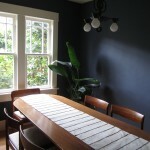 Personally I would probably play safe with charcoal grey but the artist in me votes for the blue velvet. It looks fantastic. I look forward to seeing how this chair project turns out. Blue or red velvet with yellows flowers! Thanks Gillianne, and welcome! 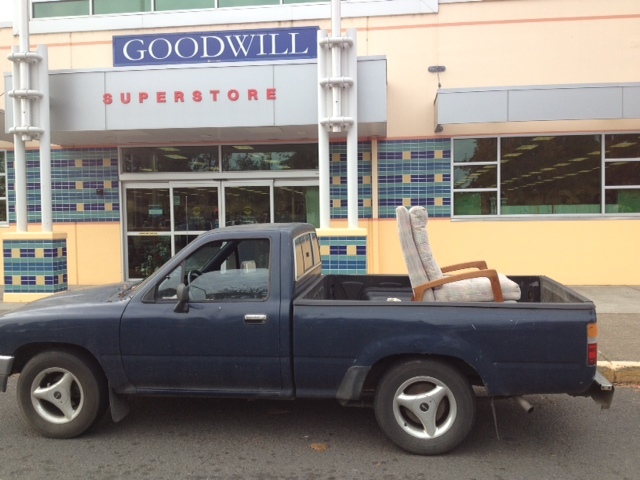 Yep it’s the Goodwill on Green Acres, and it’s a pretty good one. Happy thrifting! I am VERY late to this party, and have not yet read everyone else’s comments, but here are mine: THE GREY VELVET and NIX THE WOOD PANEL!